Anoka County officials abandoned their stadium package with the Vikings just six months after the two groups pleaded with state lawmakers to help them finance a new stadium in Blaine. Anoka County officials and Vikings owner Zygi Wilf joined together is saying the Blaine site was the best place for Vikings football. They dreamed openly about Monday Night Football broadcasts, and a possible Super Bowl, bringing football fans and their money to Anoka County. But now, Anoka County officials say they're no longer interested because the Vikings owner Zygi Wilf seems to be attracted to Minneapolis. "We're not about to start all over and re-enter into a new competition that we already won," said Steve Novak, the stadium project coordinator for Anoka County. Novak says Anoka County officials were under the impression that they were the exclusive partners with the Vikings in their stadium quest. He says they were surprised and disappointed when the Vikings agreed to a partnership with the Metrodome's landlord to study stadium possibilities in Minneapolis. "It doesn't benefit Anoka County taxpayers to negotiate against other communities to keep the Vikings in Minnesota or to be used as leverage for a better deal someplace else," he said. 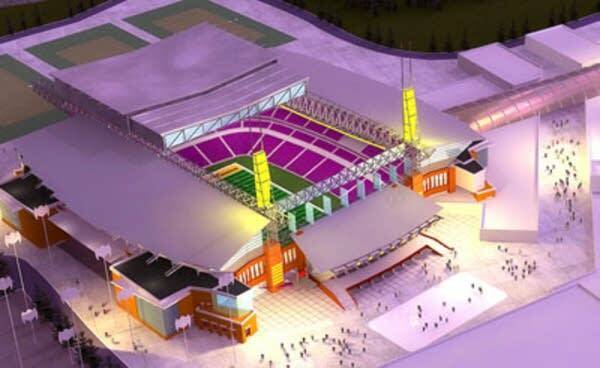 Anoka County was an attractive stadium partner with the Vikings because a majority of the county commissioners were willing to raise the county sales tax to pay for a portion of the project. The county and the team heavily lobbied the Legislature with the hopes that the Vikings would be included in last session's stadium extravanganza. Lawmakers approved a financing package for both a new Twins ballpark in downtown Minneapolis and a new on-campus football stadium for the University of Minnesota. Vikings spokesman Lester Bagley denies that the team is trying to play the two communities off each other to gain a better deal. "The Wilf's are talking about investing as much as a billion dollars into this project and it just makes good business sense that we understand our options. There were challenges in Anoka County but we thought we could work with them and we wanted to move those discussions forward and they decided to throw in the towel and that's their choice," Bagley said. Bagley says the Vikings will examine a report by an urban planner to determine if a stadium can and should be built in downtown Minneapolis. The Metropolitan Sports Facilities Commission, which owns and operates the Metrodome, is paying for the planner. But it isn't clear whether any public funding will be available. Hennepin County officials expressed little interest in increasing the sales tax especially after the bumps and bruises they received during the negotiations for the Twins. The city of Minneapolis is also an unlikely choice since the city requires voter approval for any public subsidy over $10 million. The Vikings are also bound by a lease that keeps them team in the Metrodome 2011. Minneapolis Mayor R.T. Rybak says he wouldn't venture to guess if state lawmakers would be willing to spend state money on the project. He also says he had one preliminary meeting with the Vikings owner were few details were discussed. "We have a long-term lease with the Vikings," Rybak said on Monday. "We intend to keep them to that lease. We're excited about looking at options for this land with the Vikings and without Vikings. We think the Vikings would do well here but there's been absolutely no conversation whatsoever about financing and I think that's extremely premature." It also appears that state lawmakers don't have a strong appetite to commit lengthy committee hearings and discussions on a new Vikings stadium. The Speaker-elect and the incoming Senate majority leader say it's not their top priority. The Vikings will also have to look for two new lawmakers to carry their stadium legislation. The House author retired and Sen. Don Betzold, DFL-Fridley, says he won't carry the legislation if it isn't in Anoka County. "I think the best opportunity they had was the Anoka County option there. I just don't see how the downtown stadium can be done with the proposals that have been made so far which is none," according to Betzold. A spokesman for Gov. Pawlenty said he wasn't surprised by the move. He said it's important for the team to find a local partner and the governor will wait to see what they bring to the 2007 session. Despite the hurdles, Vikings officials say they're optimistic that they can convince state lawmakers to authorize some sort of stadium in the upcoming session. Team owner Zygi Wilf has said he will not move the team.